Default value of first day of week varies according to language. For us_english is 7 that is Sunday. Dim vcReportParamter As String = "ID=5"
That is size of objParams more than actual numbers of parameter. If you get same error but due to some other reason put a comment. Since there is not any group by clause in the inner query. Attribute-centric column '' must not come after a non-attribute-centric sibling in XML hierarchy in FOR XML PATH. Cause: In SELECT Clause OrderId column must come first since it is attribute centric. Cause: Select statement from tblOrder selecting only two columns OrderId and OrderName while we are trying to insert in the three columns. So it is syntax error. Incorrect syntax near ''. If this is intended as a part of a table hint, A WITH keyword and parenthesis are now required. See SQL Server Books Online for proper syntax. Cause: It necessary to use WITH clause when we want use table hints INDEX. 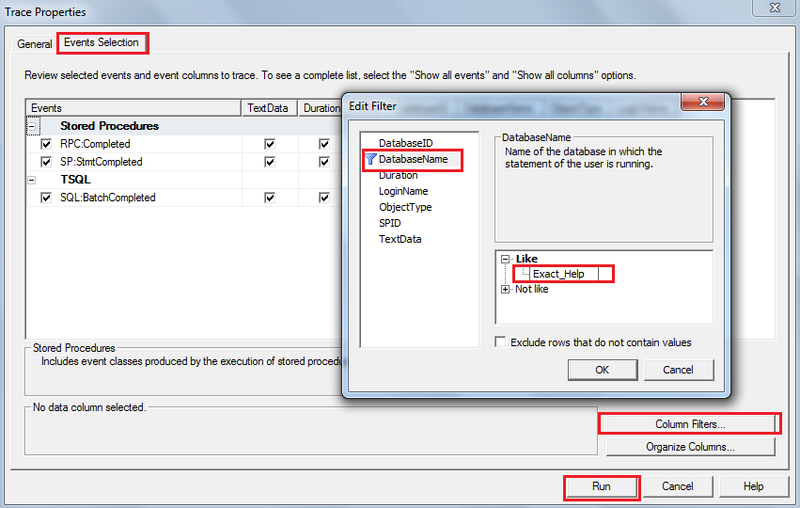 The target table '' of the OUTPUT INTO clause cannot have any enabled check constraints or any enabled rules. Found check constraint or rule ''. Cause: It is due to check constraint on table tblOrderHistory. OUTPUT INTO clause doesn't insert records in table with check constraint. How to get a recommendation from SQL server tuning advisor to improve query performance? SQL server tuning advisor in tools which accept a trace file and suggest missing indexes, statistics etc and generate various type of report like costliest queries etc. 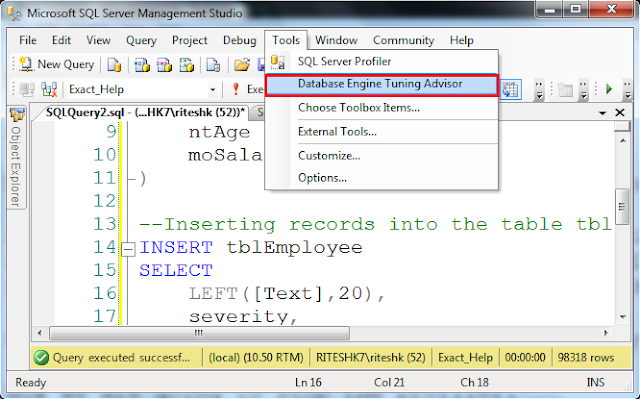 Today we are performing a demo work to know about how to use and get suggestions from SQL server tuning advisor. 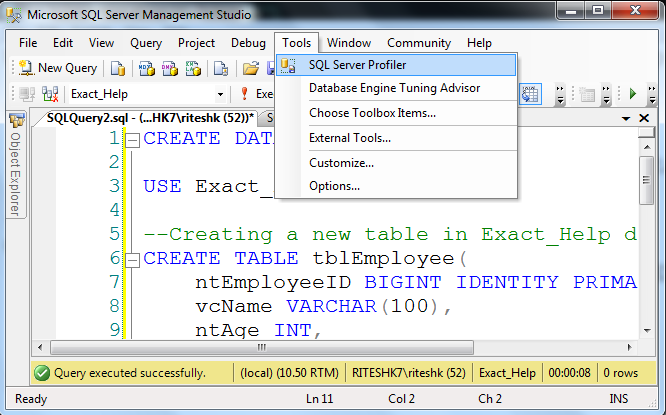 Step 2: Now we are opening SQL server profile to create a trace file. 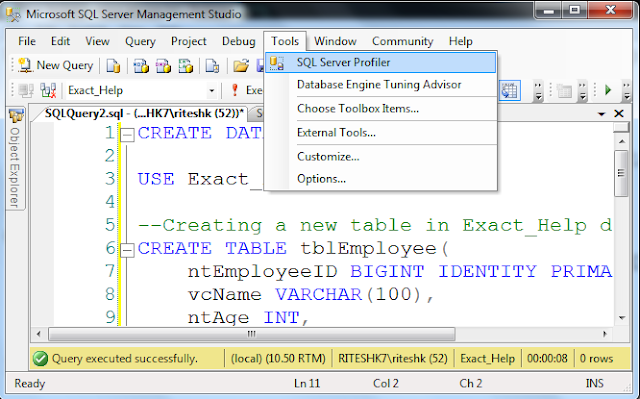 To open it, click on Tools -> SQL Server Profiler. Trace Name: You can write any trace name. Use the Template: Choose the Tuning in the drop down since we are creating a trace for tuning purpose. Save to File: To specify the path where we want to save the trace file. 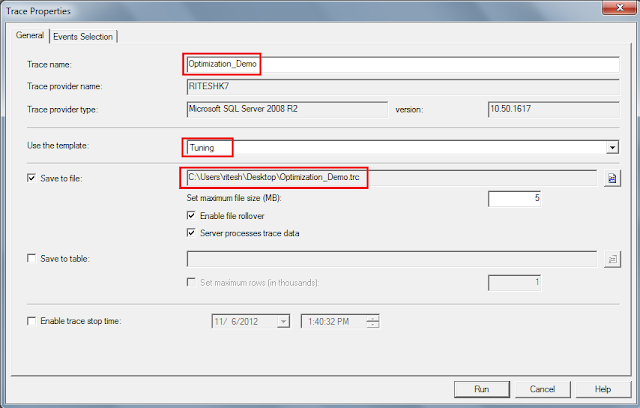 We can also save in the SQL server table. I want to restrict the tuning process for Exact_Help database. For this click on Columns Filters button and in DatabaseName write Like Exact_Help. Now Run the Profiler. 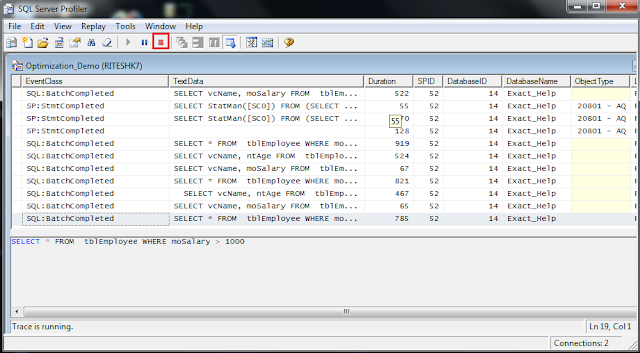 Now we are executing few SQL queries in SSMS for which we want to get query optimization recommendations. We are executing each SQL queries 3 times one by one. Now we are going to stop the profiler. In this example, we will get the Optimization_Demo.trc trace file at desktop since we have saved at this path. 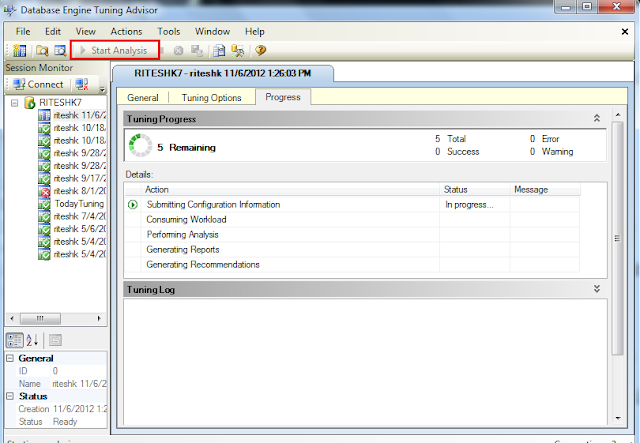 Step 4: Now we are going to open Database Engine Tuning Advisor. 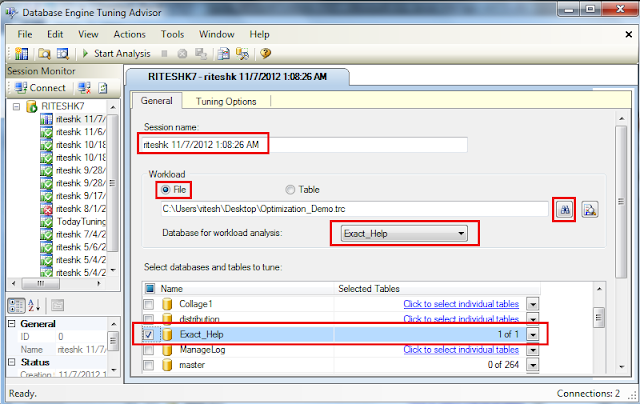 We can get it from Tools -> Database Engine Tuning Advisor. Then connect to the database engine. Session Name: You can write any session name. Workload File: Specify the path of your trace file. Database for workload analysis: Specify the database name where you want to analyze the database. 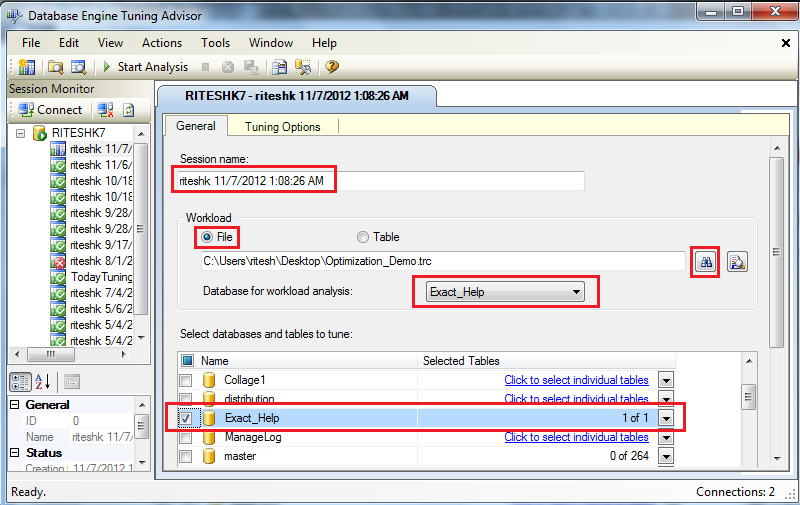 Select databases and tables to tune: Specify for which tables you want to get optimization suggestions. 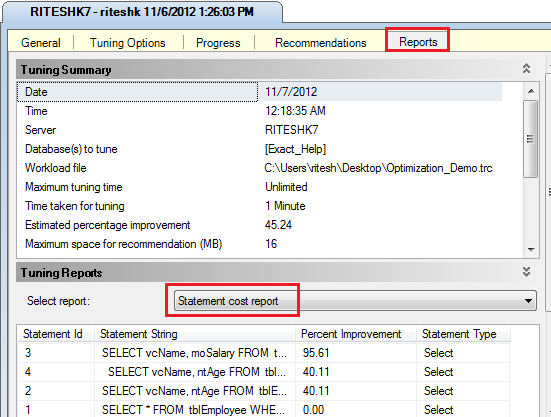 In tuning option tab there any many options which we can set according to our requirements. After some time we will get the recommendation of missing indexes, statistics etc.